This article was originally posted in barbarianmeetscoding.com. Hello! I'm back two weeks and two days after the last update on Wizards Use Vim. I've written, reviewed, sketched and drawn a lot throughout the past weeks, improving the front-cover, nearly doubling the number of pages in the book from ~120 to ~220 and publishing about 40 new versions (between 2-4 per day). Wiiihooo! After that I've focused in pumping out a lot of content with not so much regard for style and details. I've completed part of the Path of the Master up until the chapter about the command-line mode. I've done a major change in the book. Something that has been nagging at me from the very beginning but which I had just stuffed in a dark corner of my brain. I've lain awake for many nights, more than I'd like to admit, over whether to put this section here or at the end of the book. But this is such a game changer in Vim, that I will take the risk of giving you too much information, too early and I'll confide in that you are up for a challenge. I believe in you! If there's one thing that you'll find super useful early on is learning how to configure your own key mappings. That is, to customize Vim to perform actions using key mappings (key combinations) of your own devise. 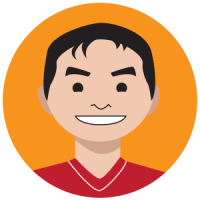 This will not only affect how effective you're at using Vim on a day to day basis, but it will also make you increasingly comfortable with configuring Vim which is one of Vim's core strengths. You are more than welcome to read my recommendations and answer with a resounding "NO Jaime! I don't think that's a good idea.". You can pick and choose the ones that you think are worthy and leave the rest. And if you want to wait before customizing Vim, and only want to rely on the defaults for the time being, that is totally OK as well. In this early section of the book we won't dive in deep right away. I'll just give you the simplest recipe for creating mappings and we'll leave the meaty part for the end of the book when you've become a more experienced Vim wizard. Excellent! You've created your first mapping! We'll be making use of this in each chapter. 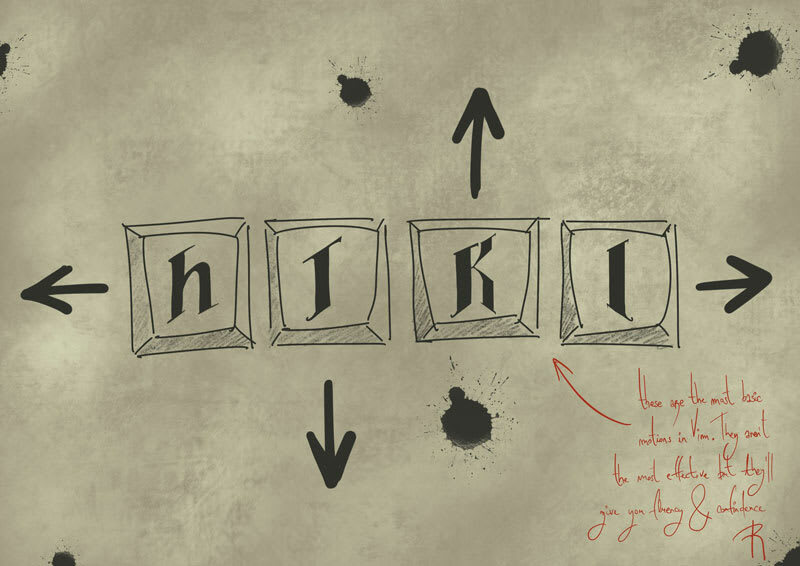 As you go learning about Vim, you will slowly start customizing it and becoming more awesome. 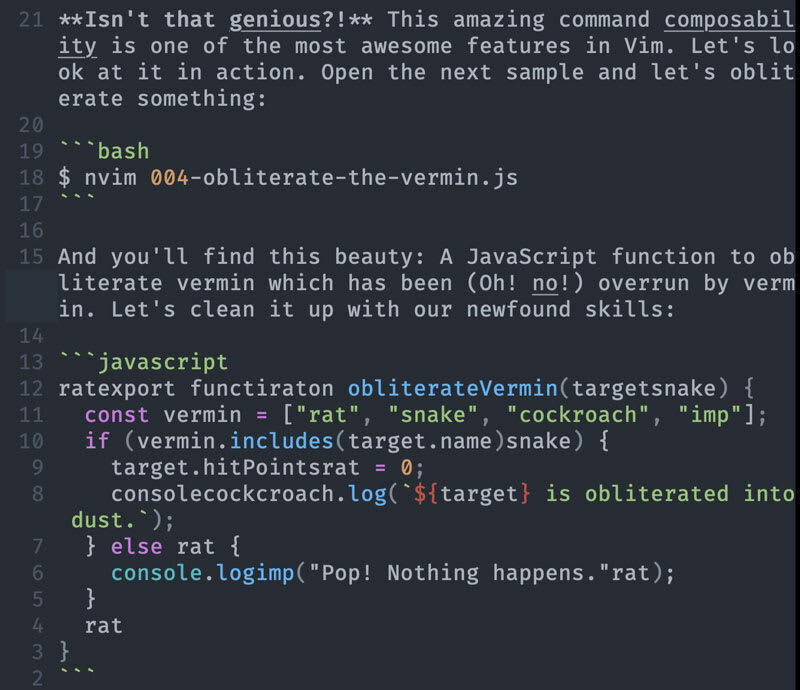 I've also been experimenting with a web-based version of Wizards Use Vim. More on that, in a not too distant future. A big concern that I have right now is the size of the book. 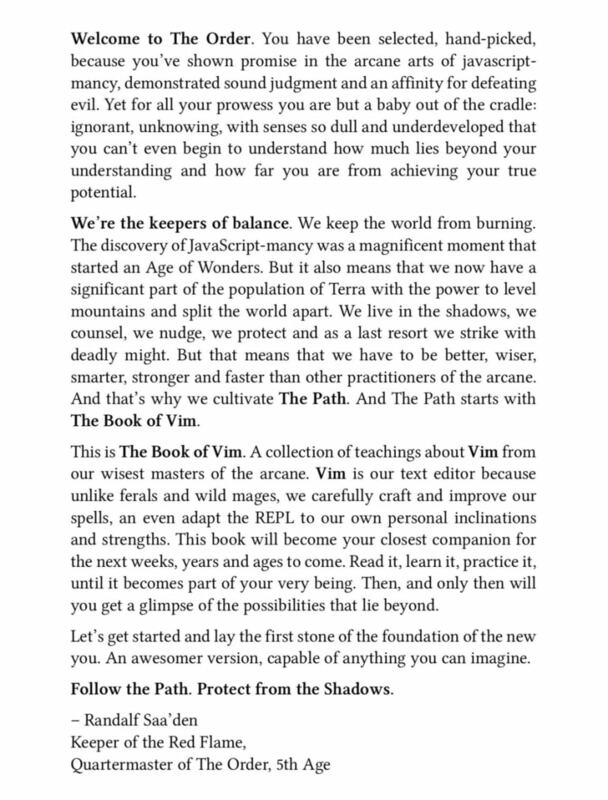 My goal with the book was to write an introductory book to Vim, something that would be small and approachable. But now I find myself with a ~200 pages book and this concerns me greatly. 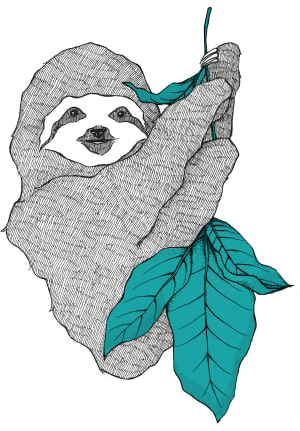 I don't want to write a Mastodon of a book. Both because it can be intimidating, and because it is a immense amount of work. I think that the approach I'm going to follow right now is to just write all the stuff I want to write as a brain dump. And then I'll tighten it up. 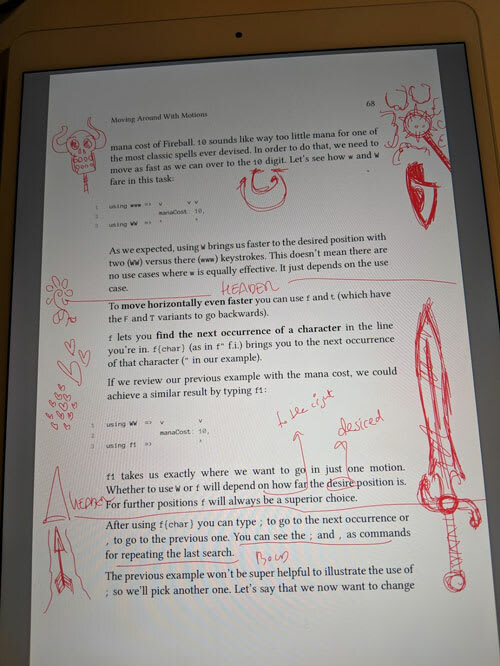 I have an inkling that the last part of the book, The Path of the Grandmaster is going to have much less depth that the initial parts (which give you a good foundation and are filled with step by step examples and thorough explanations which naturally take more pages). We'll see. And that's it for now! 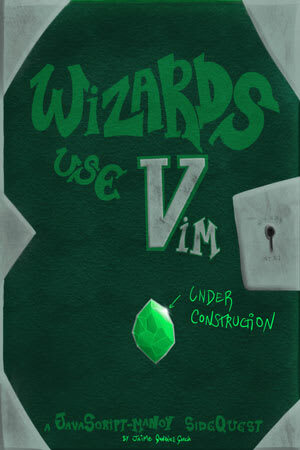 Hope you've enjoyed learning more about what's going on behind the scenes of Wizards Use Vim. And if you have any feedback, please feel free to leave me a tweet or a DM! P.S. Huge thanks and appreciation to @Faluk for his kind words and support which have given me lots more energy to continue writing and doing an awesome job of it. If you have words of appreciation for someone else's work, give them freely, people really appreciate them.